During January 2010, a salvage excavation was conducted in a private lot on Wadi el-Joz Street in Jerusalem (Permit No. A-5798; map ref. 222515/633220), prior to construction. The excavation, undertaken on behalf of the Israel Antiquities Authority and underwritten by the Abu-Ta’a family, was directed by R. Lavi, with assistance from R. Abu-Halaf (administration), A. Hajian (surveying and drafting), A. Peretz (field photography), D. Leviteh (geology), T. Kornfeld (plans), C. Hersch (pottery drawing), H. Rosenstein (metallurgical laboratory) and D.T. Ariel (numismatics). A strip of land (7–8 × 30 m; Figs. 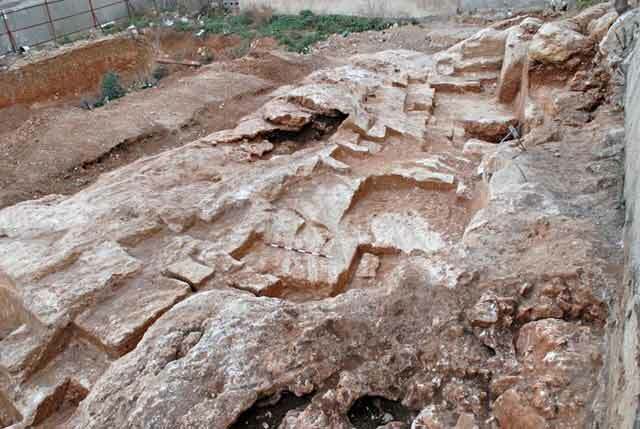 1, 2) was excavated and a rock-hewn winepress and rock-cuttings in limestone bedrock that dated to Iron Age II–III (eighth–sixth centuries BCE), as well as a quarry, possibly dating to the time of the Second Temple, were exposed. The northern part of the excavation area was cut by a sewage pipe. The area had been disturbed by a backhoe prior to the excavation. Rock-hewn Winepress (Fig. 3). A hewn treading floor (L100; 2.4 × 3.2 m) was exposed in the southern part of the area. 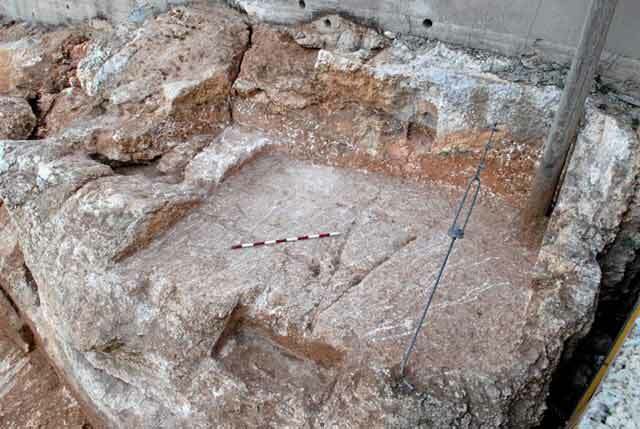 A rectangular depression (0.20–0.24 × 0.30 × 0.45 m) was hewn in the bedrock side, east of the floor (height 1.15 m); it served to anchor a beam used in the secondary pressing of the grape skins. To the west, next to the treading floor, was a hewn rectangular vat (length 0.9 m, depth 0.3 m) whose western part had been destroyed by later rock-cuttings. Grooves visible in the treading floor led to the vat. It seems that the must flowed through them from the floor to the vat, indicating the latter was probably used as a collecting vat. Rock-cuttings. A rectangular vat (A; 0.75 × 0.90 m, depth 0.35 m) was exposed north of the winepress on a lower level. A narrow hewn channel sloped from the vat’s upper southwestern corner toward the south. This channel connected to another hewn and inclined channel that led from the south, and both channels drained a short channel that extended to the west. It seems that this vat functioned as a settling pit of a winepress, which was not preserved. South of the pit, at a higher elevation, was a round depression in the bedrock (B) in which remains of plaster may have been preserved. It is possible that the vat, the channels and the depression were remains of a winepress complex that had been damaged by the activity in the quarry. Quarries. Two elongated quarries were exposed throughout the excavation area: the southern quarry (L106 – 3.5–4.0 × 9.0 m; Fig. 4), which extended beyond the limits of the excavation, and the northern quarry (L103, L104 – 4×8 m; max. hewing depth 2 m; Fig. 5). The two quarries are of the ‘courtyard’ type (Z. Safrai and A. Sasson. 2001. Quarrying and Quarries in the Land of Israel in the Period of the Mishnah and Talmud. Elkana. Pp. 4–5 [Hebrew]), and in both of them, quarrying surfaces at different elevations, severance channels (width 7–8 cm) and several stones, whose cutting was incomplete, were evident. The quarries exploited a stratum of soft limestone and were bordered on all sides by cracks and karstic voids. The quarrying surfaces sloped to the north, similar to the inclination of the bedrock, and were not completely exploited for quarrying. It seems that the utilization of the rock surfaces was not optimal and the quarrying did not follow a proper plan, but was rather random, as the need for stones arose. The stones hewn in the quarry were rectangular (c. 0.3 × 0.4 × 0.6 m). The severance channels were hewn diagonally, pointing to quarrying that was done from the front. The detachment scars indicate that the stones were separated by chisels or stakes and not by cutting horizontal severance channels. Two voids in the bedrock were discerned near the quarries. The first, with a round opening, was cut in a bedrock outcrop east of the southern quarry and the second was in the eastern part of the area (not marked on plan). Soil and debris filled the voids, which were not excavated. A few worn potsherds were discovered in the excavation, mostly dating to Iron Age II–III (eighth–sixth centuries BCE). These included bowls (Fig. 6:1–3), hole-mouths jars (Fig. 6:4–6) and a jug (Fig. 6:7). Some of the ceramic finds dated to the Mamluk period and included glazed fragments, and a number of potsherds dated to the Roman and Byzantine periods (third–seventh centuries CE). On the bedrock surface outside the quarry, a fragment of a coin (L105; IAA 135790) dating to 383–395 CE was discovered, as well as three more coins, one from 341–346 CE (IAA 135793) and the other two dated to the fourth century CE (IAA 135791–792). 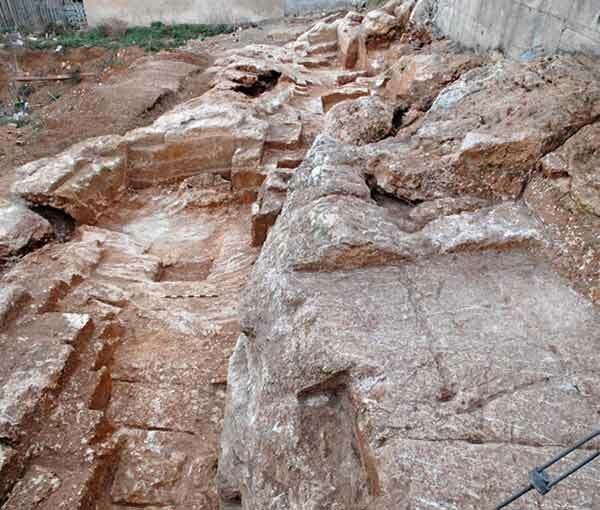 The winepress at the site, which had a niche for securing a press beam, and the rock-cuttings exposed alongside it, are similar to a complex winepress that was uncovered at Beit Safafa, dating to Iron Age II–III (‘Atiqot 44:191–238). Most of the ceramic finds in the current excavation also date to Iron Age II–III and therefore, the winepress and the rock-cuttings near it can be dated to this period. In a later period, the site was used as a quarry, which damaged the Iron Age winepress and rock-cuttings. 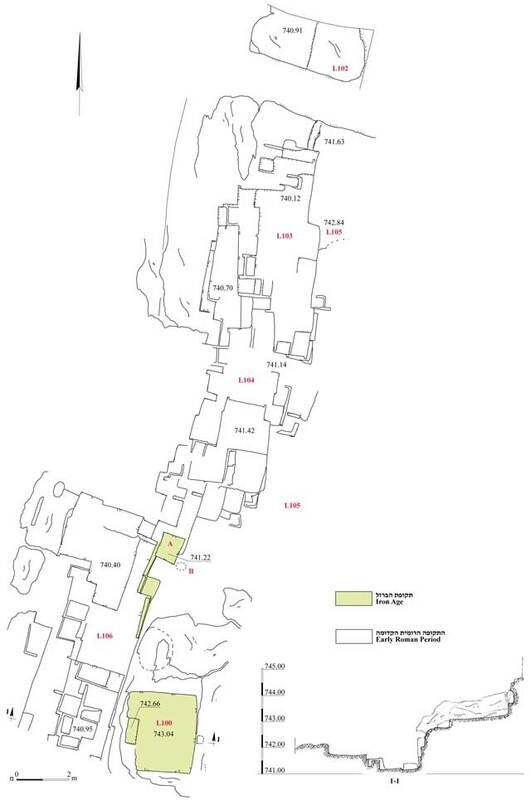 Based on the quarrying layout, it seems that the quarry should date to the Second Temple period. Ascribed to the same periods are burial caves known from the area of Wadi Joz and the slopes north of the Old City. An excavation that was conducted in the past c. 600 m west of the current excavation area revealed a quarry from the Second Temple period, in whose fill was a concentration of Iron Age II– III potsherds (B. Zissu. 2007. A Hidden Settlement from the Iron Age North of Jerusalem: The Excavations in Front of the Rambam Cave in the Upper Channel of Nahal Qidron. New Studies on Jerusalem, Twelfth Volume, Pp. 33–40). The excavator proposed to view the discovery as evidence for the existence of an Iron Age settlement, which has not yet been exposed. 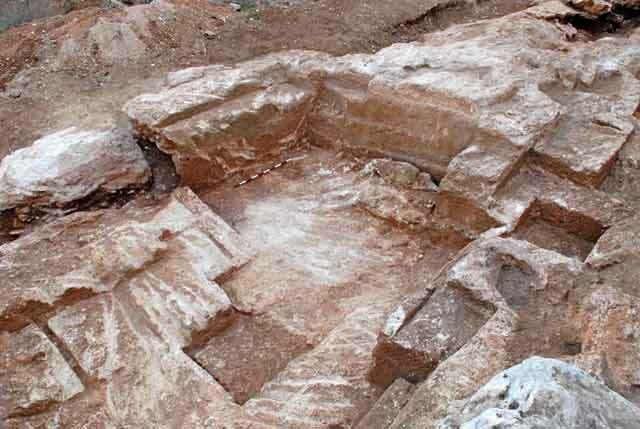 The winepress exposed in the excavation testifies to agricultural activity conducted in this region, which was part of the rural hinterland of Jerusalem in the First Temple period. 2. General view of the excavation area, looking north. 3. The winepress, looking east. 4. The southern ‘courtyard quarry’, looking northwest. 5. The northern ‘courtyard quarry’, looking north.